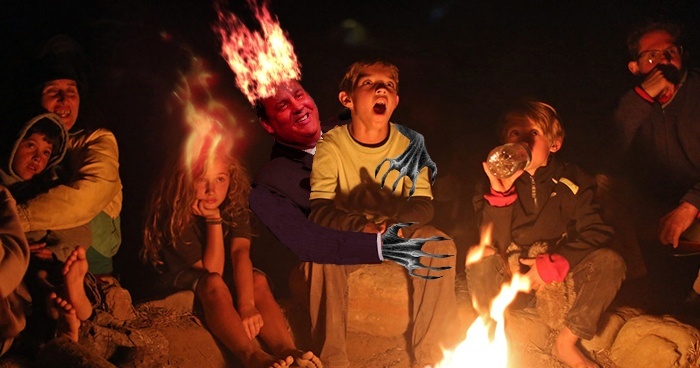 Park Rangers at Wharton State Forest are warning visitors to be on the lookout for New Jersey governor Chris Christie, who has reportedly gone feral following his humiliating dismissal from Donald Trump’s inner circle late last year. The disgraced politician has been spotted raiding campsites and picnic areas for food, and has been known to charge hikers when startled. Months of living in the wild have taken their toll on the governor, whose frame has reportedly withered to a mere 200 pounds. Witnesses also stated that he is sporting a scraggly beard and loincloth made from an old Devils jersey. He has managed to evade capture so far by chewing through snares and stealing the bait cheese from cage traps without setting them off. A spokesman for the governor’s office asked for the public’s support and understanding. “Governor Christie is going through a lot of personal and professional issues that would test anyone’s resolve,” he said. “His family requests that you respect their privacy during this difficult time.” He declined to address the rumors that Christie had learned to communicate with squirrels, and is beginning to pit them against each other in rival factions. Visitors to Wharton State Forest are advised not to wander off alone, and to place their food containers in a tree or at the top of a very steep hill. Hikers who encounter Christie on the trail should try to make themselves as big as possible and yell “you’re fired!” to scare him off.